If you played the game you know that following Lois Lane's death, the Man of Steel crosses over to the dark side. Finding that the only way to protect humanity is to implement martial law, he sets out to create a new world order with him at the helm and any hero that disagrees, will find themselves and outlaw or worse, dead. Even in a totalitarian state the people will not submit to this new world order and a resistance is formed, led by the Dark Knight. 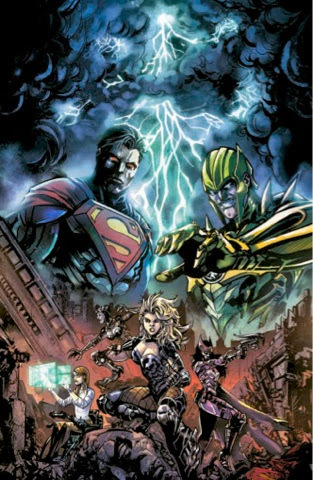 Batman and his allies, know Superman has gone too far and they must bring him down. 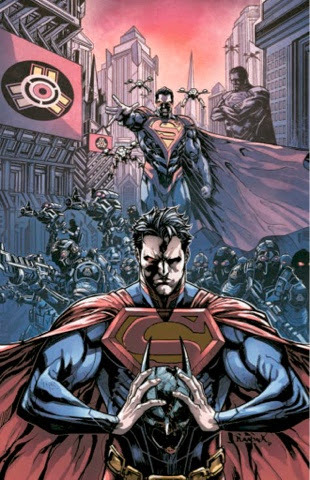 The story is riveting and engaging, you never think of the day you will see the JLA as the bad guys and more importantly, you never think of the day when Sinestro and Superman will be allies. The illustrations are incredible, they implement a much darker color scheme that conveys atrocities of this new world. This is one series you definitely have to follow to the bitter end and see how many heroes will fall from grace.